The Asia-Pacific Journal Vol 9, Issue 21 No 2, May 23, 2011. On the danger of a killer earthquake in the Japanese Archipelago. At their press conferences, the Tokyo Electric Co. (Tepco) officials say, as if it were an excuse, that the 3/11 earthquake and tsunami in northeastern Japan were “outside their expectations”. Look it up in the dictionary; that’s the definition of “accident.” For decades common-sense opponents of nuclear power, in Japan and all over the world, have been asking the common-sense question, What if there is an accident? For this they were ridiculed and scorned by the nuclear engineers and their spokespersons. We, suffer an accident? In our world there are no accidents! Playing with nuclear power is playing God, which is by far the most corrupting game of all. In Japan, one of the loudest, most persistent and best informed of the voices asking this common sense question has been that of Hirose Takashi. Mr. Hirose first came into public view with a Swiftean satire he published in 1981, Tokyo e, Genpatsu wo! 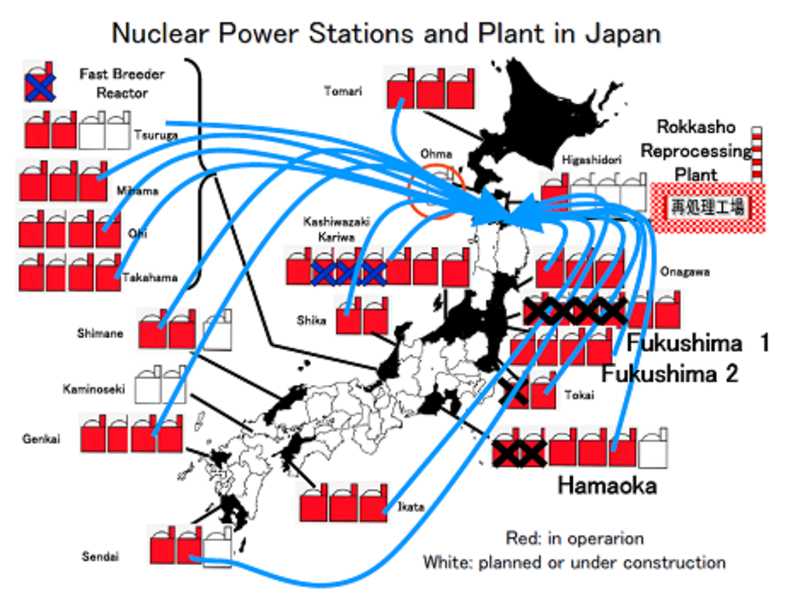 (Nuclear Power Plants to Tokyo!). (Shueisha) In that work, he made the argument that, if it is really true that these plants are perfectly safe (“accidents never happen”) then why not build them in downtown Tokyo rather than in far-off places? By putting them so far away you lose half the electricity in the wires, and waste all that hot water by pumping it into the ocean instead of delivering it to people’s homes where it could be used for baths and cooking. The book outraged a lot of people – especially in Tokyo – and revealed the hypocrisy of the safety argument. 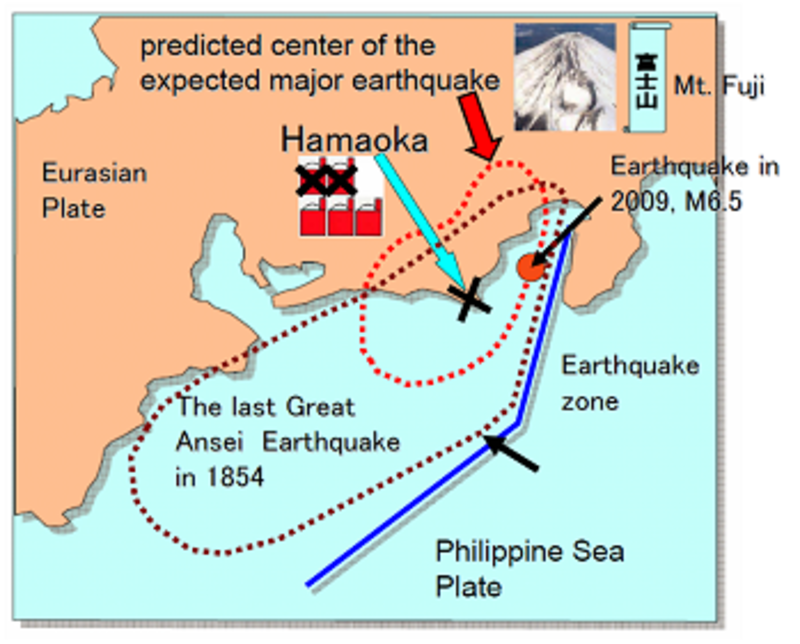 And as I had feared, after the Suruga Bay Earthquake of August 2009 came as a triple shock, it was followed in September and October by earthquakes off Samoa, Sumatra, and Vanuatu, of magnitudes between 7.6 and 8.2. That means three to eleven times the force of the Southern Hyogo Prefecture Earthquake. 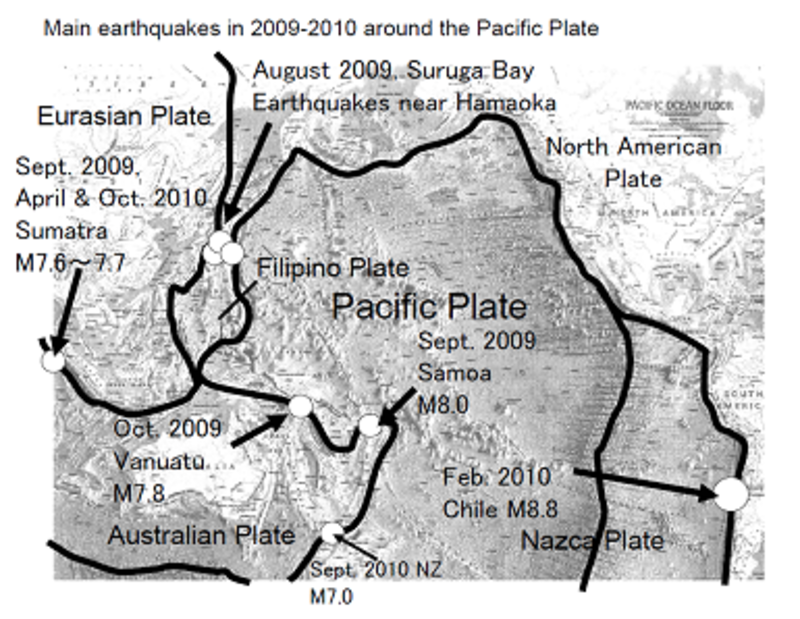 As you can see in the accompanying chart, all of these quakes occurred around the Pacific Plate as the center, and each was located at the boundary of either that plate or a plate under its influence. Then in the following year, 2010, in January there came the Haiti Earthquake, at the boundary of the Caribbean Plate, pushed by the Pacific and Coco Plates, then in February the huge 8.8 magnitude earthquake offshore from Chile. I was praying that this world scale series of earthquakes would come to an end, but the movement of the Pacific Plate shows no sign of stopping, and led in 2011 to the 3/11 Earthquake in northeastern Japan and the subsequent meltdown at the Fukushima Nuclear Plant. Is the Rokkasho Reprocessing Plant Safe? 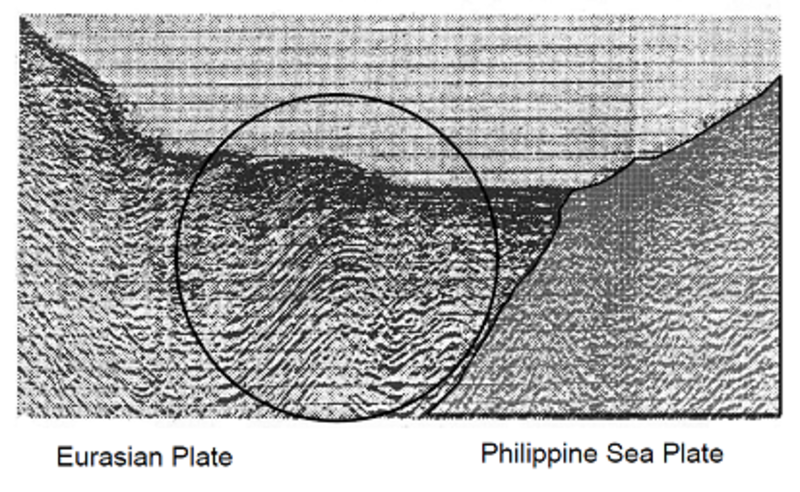 And sonar readings at the site indicate that from thirty years back the Eurasian plate has been bending, which means that it is in a condition where it can be expected eventually to spring back. Hong Kong manufacturers in the Pearl River Delta are battling to maintain operations in the face of power shortages which are disrupting production and pushing up costs. Some have complained of power cuts of up to three days a week in Shenzhen and of two days in Dongguan, a production hub, forcing them to resort to dirtier and more expensive diesel generators, and disrupting production schedules. Key industry bodies have predicted that increasing difficulties in the delta, dubbed the world’s workshop, will force more factories out of business. Sources close to the Hong Kong Economic Trade Office in Guangdong said the number of Hong Kong factories dwindled to about 35,000 at the end of last year from 39,000 at the beginning of the year and from the 2007 peak of 80,000. Hong Kong Small and Medium Enterprises Association chairman Danny Lau Tat-pong said manufacturers “had their backs to the wall” because of a series of challenges, including power shortages, rising wages and raw material costs, a state policy of upgrading industries, a rising yuan and Middle East political turmoil. Ricky Yeung, a manufacturer of high-end cooking utensils under the “Siliconezone” brand, said electricity at his factory in the Boan district of Shenzhen had been suspended every Tuesday, Thursday and Saturday since the start of this month. The mainland looks set for its worst power shortages since 2004 owing to limited coal supplies. Yeung said the power cuts were also caused by maintenance work at some power plants, and the Shenzhen municipal government had ordered factories and power plants to cut emissions to clear the air before a sports gala for university students in August. However, these initiatives would not work, because manufacturers, including Yeung, would use diesel-fuelled generators. Yeung said the power situation was worrying, with the peak production season looming next month. Lau, who runs a factory near Dongguan producing curtain walls for skyscrapers, said he was faring better, with power cuts only a once a week. The cuts come as manufacturers are already reeling from a rising yuan. Spot yuan strengthened against the US dollar at 6.4926 on Friday from Thursday’s 6.5039. The yuan has now appreciated 5.14 per cent since it was de-pegged from the greenback in June 2010, and 1.47 per cent since the beginning of this year. Economists with brokerages such as Morgan Stanley, UBS, Deutsche Bank and Goldman Sachs have predicted that the currency will rise by 5 per cent to 6 per cent this year. Another blow for manufacturers has been the government’s policy of boosting minimum wages, which are expected to grow by at least 13 per cent annually in the next five years, to drive domestic consumption as the mainland shifts away from exports.